Sandwich construction around here usually starts off like Dagwood out of a Blondie comic. I pull everything useable out of the fridge and start throwing ingredients together. This sandwich is no exception, and it came together rather resembling a croque madam. If the croque madam lived in America that is! Warm up a sandwich press or nonstick frying pan to medium high heat. Mean while mix together Dijon and mayonnaise. Then brush the outsides of the bread with melted butter, and insides with the Dijon mixture. Break the Swiss cheese in half and place on the inside of each bread slice. 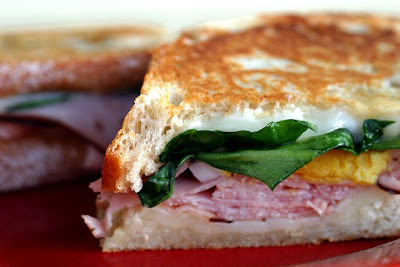 Top two halves with ham, egg slices, salt, pepper, and spinach. Top with the second slice of bread and cheese. Press or grill until golden. Simple yet perfect. That looks beautiful!! Hi Laura - DFO has listed a link to your site on the front page of HBO late today - in Hump Day Wildcard! Heh, as you have probably noticed from reading my blog, I love the term "Fancy Pants". I am very happy to see I am not the only one using it! I saw that and laughed!